In the film ‘It’s a wonderful life’ they say that every time you hear a bell ring, it means that some angel has just got his wings. Paris is a city of bells, so perhaps that is why there are so many Paris angels. Châtelet, I was soon in Place du Châtelet. Châtelet was once a small fort guarding the Pont du Change and several prisons before demolishment in stages between 1802 and 1810. This Paris angel arrived shortly after 1806 and looks down at the theatre-bordered square from atop the column of the Palmier Fountain. The demolition of the Châtelet falls in the period of the great redesign of Paris by Hausemann. He had been instructed to do so by Napoleon III and in so doing to bring more light and air into what were overcrowded and bleak neighbourhoods. Nephew of Napoléon Bonapart, Louis-Napoléon Bonaparte had been elected by a huge majority, but at the end of his term he was prevented from standing again due to political manoevering that introduced a new Constitution (not ratified by the two thirds votes needed to do so). Through a coup d'état with the aid of the army Louis regained power and declared himself Napoléon III. 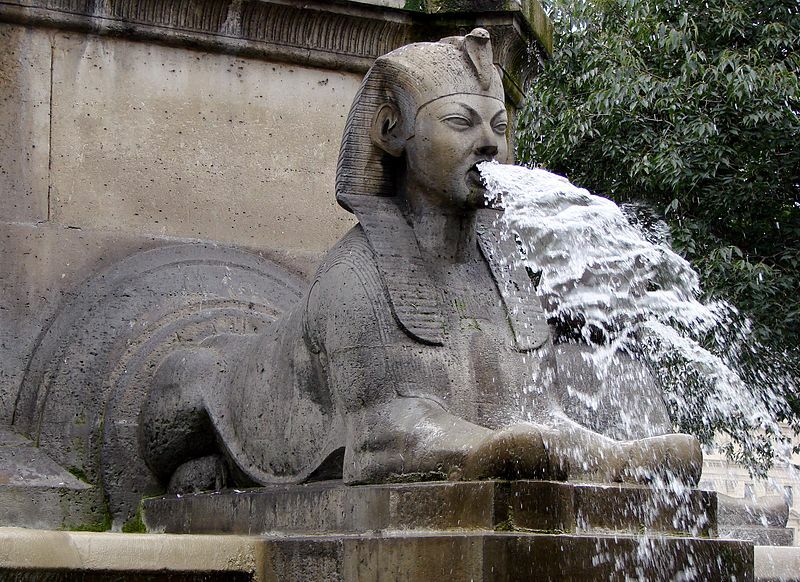 Rapidly continuing his plans to make Paris an artistic and great city with space and parks for its people, the need for free and safe drinking water caused an edict to bring into effect a system of fountains in Paris. 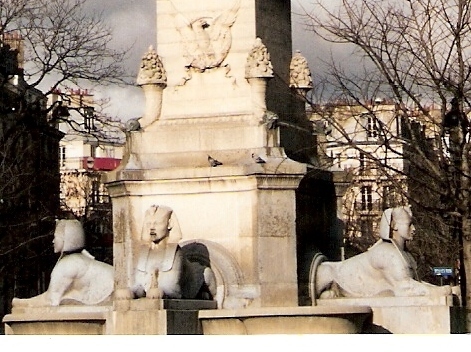 The Palmier Fountain therefore served two purposes: providing much needed free, safe drinking water and serving as a monument to the Egyptian battles of Napoléon. Photo courtesy of Wikimedia Commons: Photographer Vassil. The sphinx at the base of the Palmier Fountain were designed by a colleague of Hausemann, Jean-Antoine-Gabriel Davioud: designer of the Moorish/Byzantine mixture of architecture of the Palais du Trocadéro, deisgned for the 1867 World's Fair. The expense of its construction delayed the inevitable demolition of an unpopular palace. 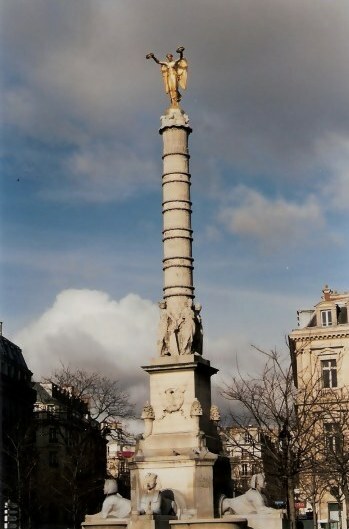 The actual sculpture was created by Henri Alfred Marie Jacquemart, usually known just as Alfred Jacquemart. He was a noted 'animalier' sculptor of the era before his sudden death in 1896. Our angel atop the Palmier fountain is in gilded bronze and the original is the work of Louis-Simon Boizot, whose abilities as an award winning scuptor echo the design background of his father who was a designer at the Gobelin Tapestry works. As Boizet also married the daughter of a well-reputed sculptor, one wonders what amazing design heritage their offspring have brought us. This angel is lovely - but not the real thing. She is only a copy. 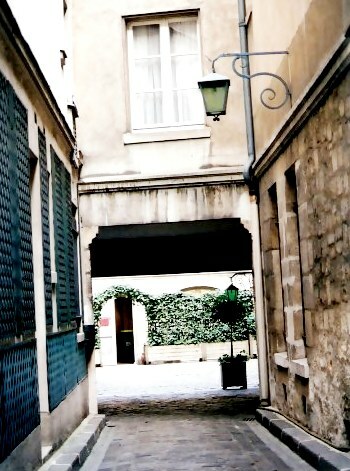 The original is in the Carnivalet Museum of the History of Paris. 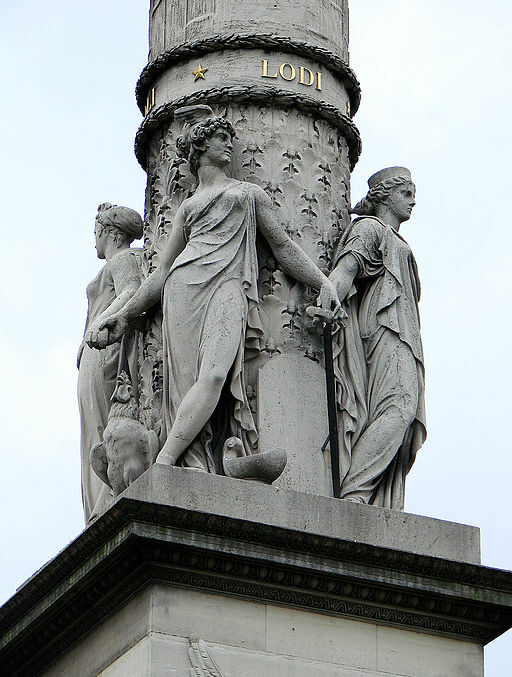 You can see from the beauty of the statues of Vigilance, Justice, Strength and Prudence, holding hands to protect the angel's column, that it is no wonder Boizot is better known for his designs for Sèvres porcelain. In the early 1800s porcelain was the ultimate luxury for the moneyed families of Europe. The factory benefited from its royal patronage: Marie Antoinette purchased a wide range of porcelain from including an exquisite dinner service that when completed was instead given by Louis XIV to King Gustav III as a diplomatic gift. Another was rapidly completed for her majesty. The factory at Sèvres attracted the most acclaimed sculptors. The famous Sèvres works competed against - and finally supplanted the already famous works of Meissen in Dresden to become the leading porcelain manufacturers of Europe until the early 19th century. Danzig in Prussia in 1807. This famous expedition was not just one to conquer the territories of the British. Already elected in 1798 to the French Academy of Sciences, Napoléon gathered alongside his soldiers a small cadre of 67 men of science. These included mathematicians, naturalists, chemists, and geodesists (those who measure the earth's a geometric shape, orientation in space, and gravitational field). It was this expedition that gave us the Rosetta Stone. It was a particularly brutal campaign. In Jaffra, discovering that most of the defenders were former prisoners of war, Napoléon ordered that they be executed by droning or by bayonet and for three days this was the fate of the men, women, and children. It was to end ignominiously with the plague ridden remaining troops being poisoned with opium as they were slowing the retreat, Staring with 13,000 men, Napoléon returned with 1000 wounded and a handful of well soldiers - the number varying up to 580. 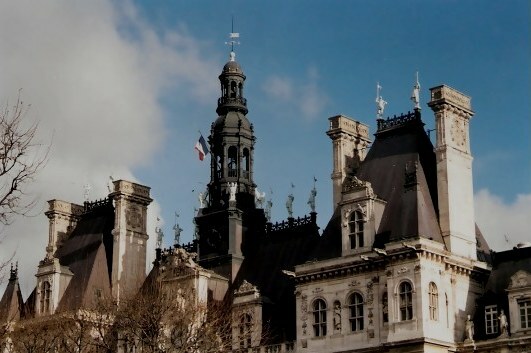 I wandered down this side street, deserted by the crowds that generally stay on the main boulevards …and emerged in a familiar place, the Paris Hôtel de Ville – the Town Hall of Paris. The Hôtel de Ville doors are appropriately flanked by sculptures representing Art and Science. The Paris Town Hall is an old friend to me, for one of my favourite tango bars used to be nearby. It was small, crowded, had an active bar that was a hangout for Spanish speaking Parisians – and it was from where we were whisked at 3am one morning to have a “locals tour” of Paris. Standing beneath the Eiffel Tower with no other people about is something rare. At 3:30 in the morning we were there alone. It was a memorable Paris experience: the lights of the Seine bridges, the windows of Au Printemp – all seemingly presented just for us. Alas, this busy bar of former times is now a more formal tango dance hall and the character-filled place I sought to again find was gone forever – like the wonderful crowded Latin night club off Avenue Franklin D. Roosevelt, just below the Arc de Triomphe. I had been here many times. After checking coat and handbag I would be caught up to dance across to the staircase, then again by someone else on the landing below, and again by yet another on the larger dance floor on that level, and once more by someone else in the main dance pit on the final level. Sometimes I just moved between the dancers to take up a post on the railings watching the passion of the dancers below. It was a favourite on Thursday night for Latin dance. Sadly, when I sought it in 2015 it had been transformed into a clinical and almost empty, modern, sterile bar with piped music and no character or soul. But the memories remain of steamy summer nights and cooling off in the arcade alongside, and of the bouncers who always acted as if you were a regular and welcomed you back. After a night of dancing there, I can remember waiting on the café terraces of the Champs-Élysées for the Metro to start again at 6am – along with the hundreds of other people looking a bit “left over from the night before” and similarly stranded in Paris, waiting for transport. 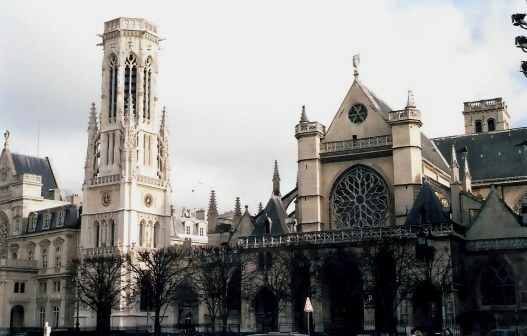 On August 24th 1572, St. Batholomew’s Day, the tolling bells for Matins at Saint-Germain-l’Auxerrois marked the call to arms of the supporters of the powerful anti-protestant group around Catholic Catherine de Médicis. The signal started an attack on the wealthy Protestant Huguenots who had gathered in Paris to celebrate the marriage of Henri de Navarre to Margeurite de Valois - and the killings continued throughout the following months. The French Protestants left us a heritage of famous people whose lineage includes Huguenot bloodlines, so we should be grateful that the bloodshed didn't eliminate all of them. Those with Huguenot heritage reputedly include U.S. Presidents George Washington, John Adams, John Quincy Adams, John Tyler, James Garfield, and Theodore Roosevelt. Also with Huguenot heritage was Paul Revere whose famous ride is a legend of the American Revolution. He was the son of Apollos de Revoire, a French Huguenot who had fled to Boston. General George Patton, Admiral Dewey, Du Pont, Henry Thoreau and Longfellow are also reputed to be of Huguenot heritage, and many Huguenots were early leaders in the development of the Canadian fur trade and Newfoundland fishing industry. 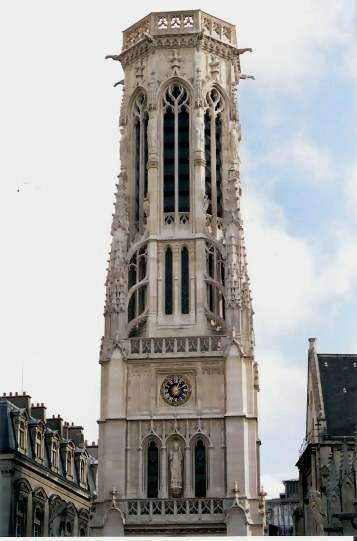 The church of Saint-Germain-l’Auxerrois secured another place in history when it was pillaged before becoming a storehouse and police station during the French Revolution. But the bell from the main tower is innocent in the case of tolling for revolution of any sort. It was the bells of the tower on the south side that were rung on St. Batholomew’s Day. If you hear the bell now, she is called Marie, and her tones drift across to the Louvre on a summer breeze or a chilly winter wind. I like the non-icon churches of Paris – and there are many tucked away in small gardens and on hilltops - but the church of Saint-Germain-l'Auxerrois - a bit of Roman, a bit Gothic and with some Renaissance, all somehow working together – especially attracts me. 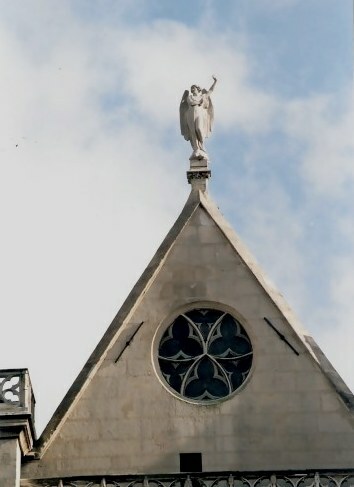 Saint-Germain-l'Auxerrois was once the church of the Louvre – when it was not a museum, but a royal palace - and this Paris angel watches over you from the rooftop peak. In the past she must have been kept busy making blessings from this vantage point over the bloody scenes below. Paris seems to be a city full of angel images and I often wonder how busy our angels must be. but I have spread my wings a bit.